Christmas decorating can be super stressful; it’s time consuming, takes out a lot of energy and if you’re on a tight budget, it can be really expensive. 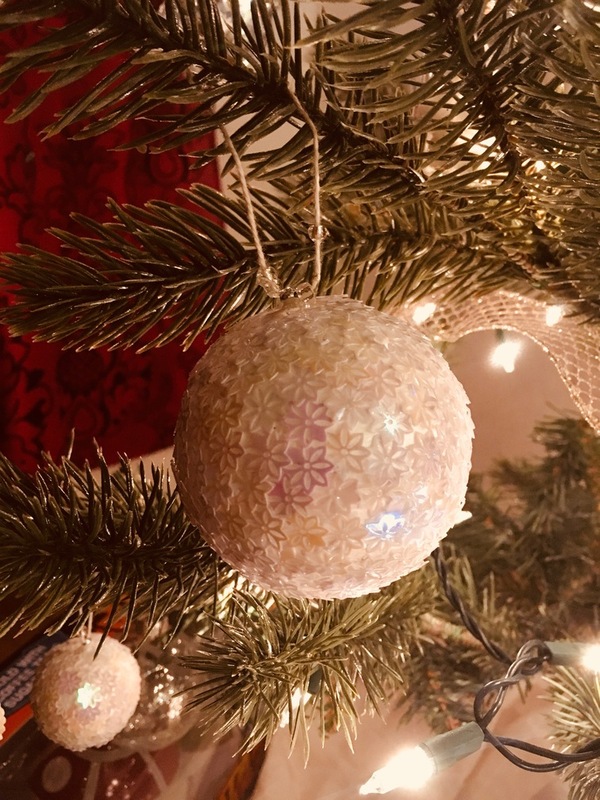 I finally figured out how to cut corners on decorating my tree, and I think it’s time to let you in on the “not a big secret” secret - DIY Christmas ornaments. DIY ornaments are personal, unique and each ornament comes with its own story. You can't really do that with an ornament set you got from the store - "I spent fifteen minutes trying to make up my mind about this particular ornament". If you spent each year of your childhood making your own ornaments at home/school, you probably get where I'm going with this. 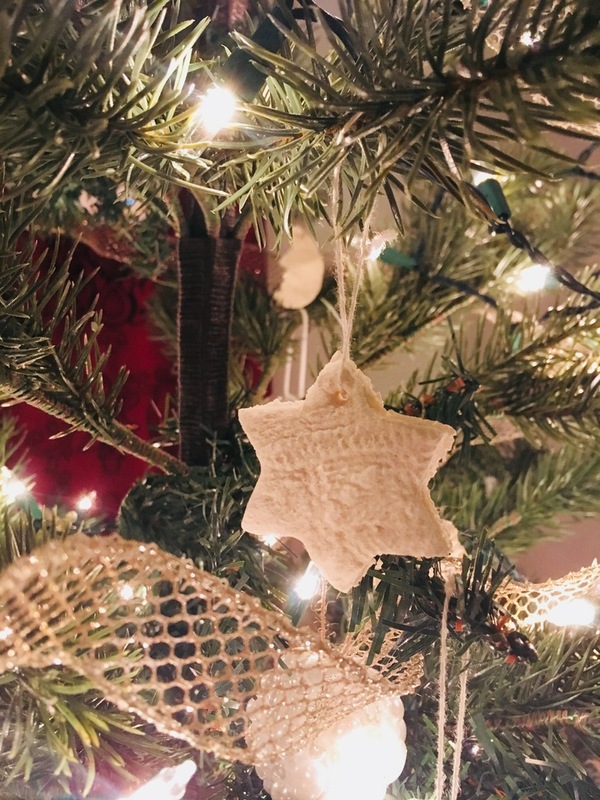 But if you’re like me, and you’re starting new traditions with very little to spare in your pockets, DIY ornaments can be a whole new and unexplored territory. I spent almost 5 days conducting my own lab trials with these different decorations, but each one won’t take more than 20 minutes - unless you intend on counting glitter cleanup. Glitter cleanup is a whole other story, but that’s for another day. 1 pack of medium and small styrofoam balls each - mine were packaged at the Dollar Store as 6 medium size and 10 small. 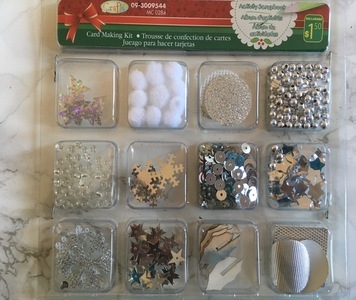 Sequins or buttons and beads to stick on ornaments - I spent a total of $5 for a couple sheets of reflective diamond stickers and a couple packets of assorted sequins and stones in white and grey. 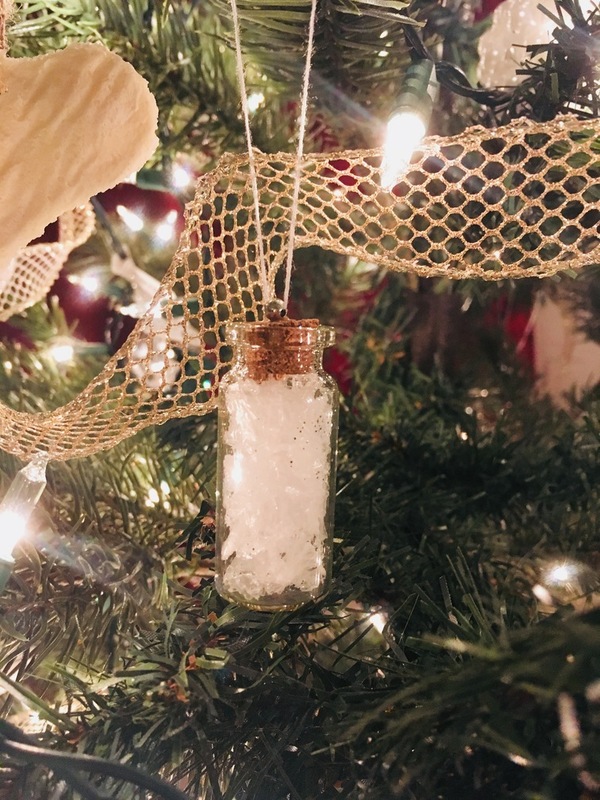 Fake snow (I got mine from the dollar store for $2) ; you can use epsom salt as an alternative, or just roll some cotton into pea sized-balls to make it look like snowballs. Paint palette to put your glue, paint and all these tiny, pesky decorative bits. 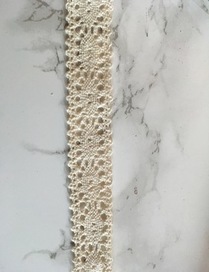 For the crochet lace glass ornaments, chop up your lace trimmings in rough lengths between 1-3 inches. You’ll want to have a ratio of 3:1 for long and short lengths respectively. Sadly I don't have any photos of the process with glass ornaments, sorry! Next, ensure your glass ornament is clean - use isopropyl alcohol in a spray bottle to clean off any dirt. Brush on some white glue on on end of your ornament. Stick on your longer pieces of lace at various angles to each other as you please. Keep glueing your pieces till you have covered most of your ornament. I used the 1 inch pieces to only cover up spots that had big gaps after I’d completed sticking on the bigger pieces. Thread your ornament to hang. 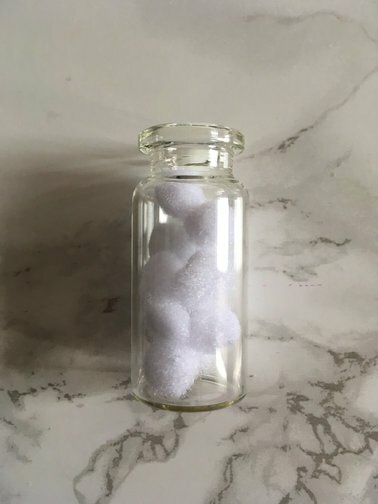 Fill 90% of your bottle with “snow balls” from the card making kit, or fake snow, or epsom salt. Cap your mini bottle shut with the cork.If you want, you can also fill your bottles with shiny sequins to make a tiny Christmas scene. Take a few beads - anywhere between 1-4 and thread them with the thread you plan on hanging your ornament with. Tie both ends of the thread together and reposition the knot inside the beads to make the knot invisible. This bottle filled with fake snow sparkles when the lights are on! Using a hot glue gun, place a bead of hot glue on the cork of the bottle and promptly stick 1 bead from the previous step on the cork. Let dry and hang. 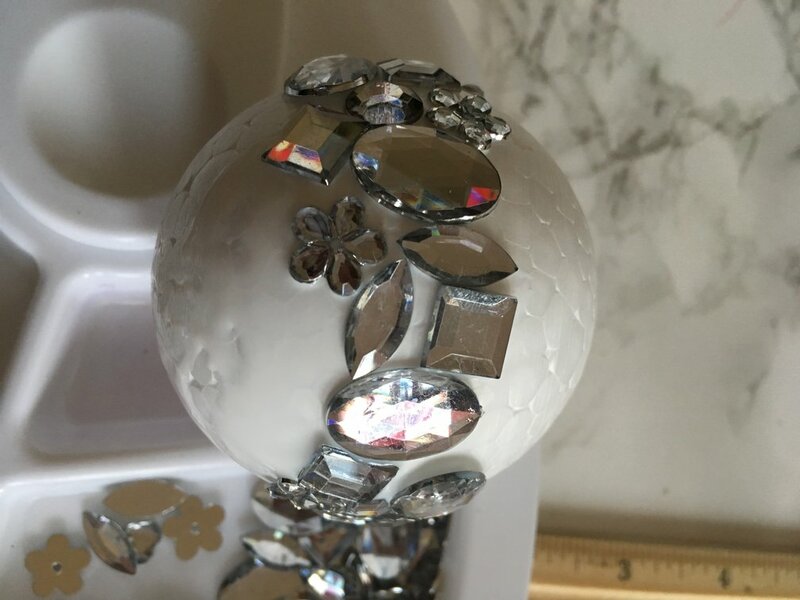 For this ornament, start off with a clean ornament surface using isopropyl alcohol. Use a paint brush in a size between 2-5 and paint a little squiggle with a thin coat of white acrylic paint. I did not think about the fact that my design could easily be rubbed off, and once I realized this, I didn’t feel like redoing my work with glass paints. Not the best photo, but you get the picture - this is what your design would look like, only, neater. If you want a more permanent finish, use white glass paint instead of white acrylic paint. Keep painting squiggles, each new row at an indent, until you almost reach the beginning. If you’re worried about smearing your design, let the paint dry before continuing on a new patch. Add some dots in between the squiggles - makes for a less monotonous design, and also fills in awkward gaps in between your squiggles! Start by locating the diameter of the ball, most likely marked by a faint line. Using your brush, glue on one sequin/bead/stone at a time. With the star ornaments, I followed a strict row pattern as I continued sticking. 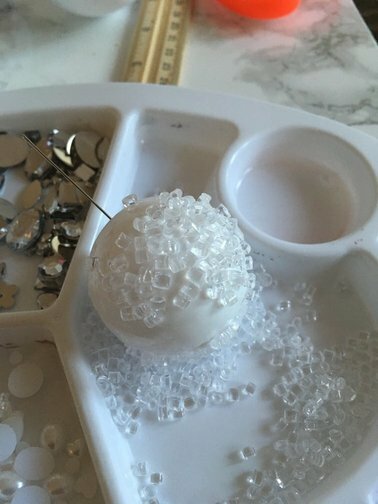 You can choose to stick your stones/beads/sequins section by section instead, which makes it easier to handle the styrofoam ball as you work. 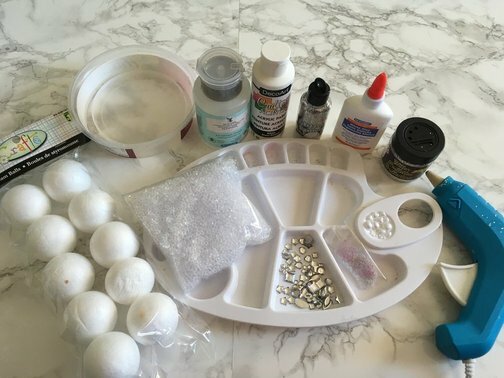 For tiny beads or vase fillers - paint on a thin layer of glue and dip your styrofoam ball into a plate filled with beads/fillers. Let dry, and continue section by section till the ball is completely covered. Avoid moving these until they’re completely dry because the beads are more prone to sliding around before they dry. The stones here were actually stickers, and stuck on like superglue to the balls! A good trick to keeping your fingers off the styrofoam ball is to insert a toothpick or a cross-stitch needle. In my experience, a sewing needle will only cause the styrofoam ball to keep rotating. 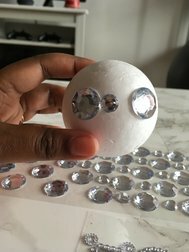 With the reflective sticky stones, I was lucky enough to be able to just stick on the stones directly on the styrofoam balls. I just went with random patterns in this case. 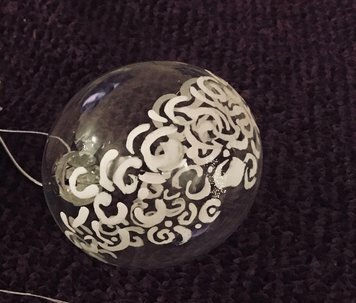 When taking a break, or resting your ornament on any surface, keep in mind that your ornament has a good chance of rolling till the section you've worked on is hitting the surface - it's not magic, just good ol' gravity giving you a hard time. Try resting your ornament over something like a shot glass to prevent your ornament from rolling around. Vase fillers Christmas ornament- they even sell the same thing at the dollar store in a bigger size!! You can cover the white space, but I like the way these stones pop against the swhite space! 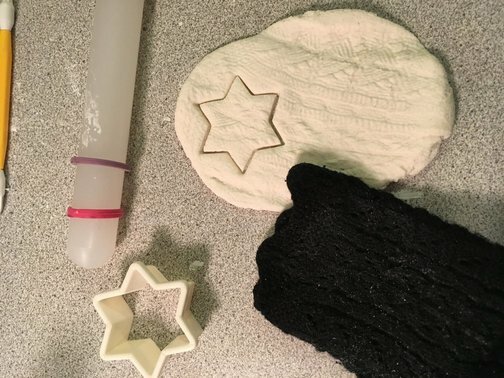 Now I’ve only ever made salt dough ornaments once before, and it was at a ornament making party with pre-made dough, so I decided to look around for recipes. Check out Giustina’s white salt dough recipe at Domestically Blissful for the recipe and instructions. 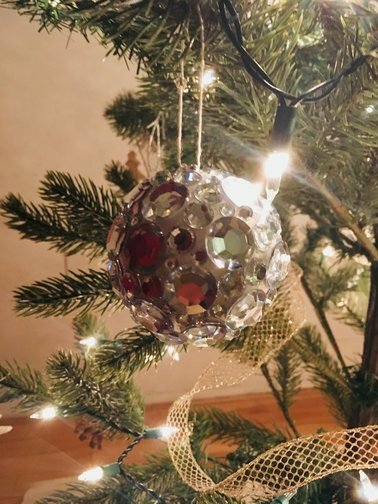 Don’t forget to make a hole big enough for some thread to hang the ornaments! Now there is a clear warning in the post about the this dough being quite a bit. I didn’t notice that line until I actually already made the dough, but I ended up using the extra dough to make a star banner. You should consider cutting the quantities in half if you only want to made around 10-15 small to medium sized ornaments. To make this recipe more specific, I added in around 1.5-2tsp of white acrylic paint. While I used acrylic paint from the dollar store, I would recommend finding something that is non-toxic if you plan on using cookie cutters like I did. 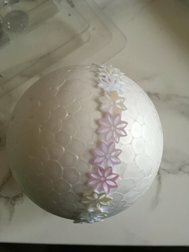 The best results come from using stamping tools, but since I didn’t want to spend money for a tool I’d only use once or twice a year, I just used things I found at home to make impressions. The key is to roll, make a strong impression and then gently cut your dough with the cookie cutter. 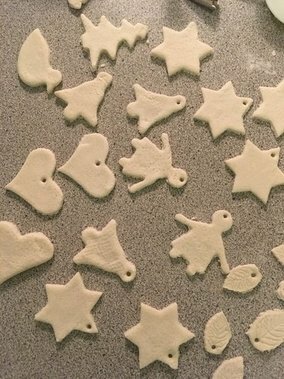 If you roll your dough out thin enough, these ornaments will dry in about an hour and a half. 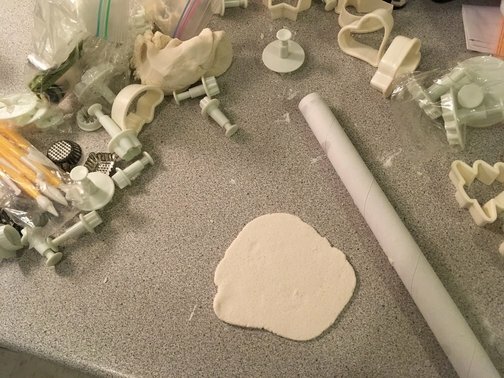 Ensure your dough is well spread out on a flat surface to prevent them from curling. 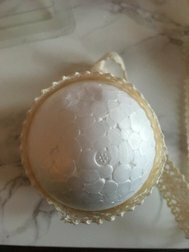 Find a good medium between a thin and thick layer of glue - too thin, and your material won’t stick to the ornament; too thick, and you’ll have your decorative elements sliding around as you move onto another piece. Handle your ornament carefully as you complete this activity. If you’d rather, gently rest the ornament on the mouth of a small cup or your paint palette till the glue dries, and continue sticking the remaining pieces. Although hot glue works like a charm with this DIY, white glue still does the trick, albeit with a bit of patience. Some of these decorative pieces are best stuck on with a glue gun or a heavy duty glue that dries quickly. Since I was strapped for cash, I did not use Modge Podge for this activity, and opted to use a hot glue gun instead. 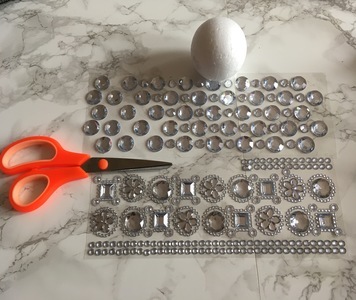 Using a hot glue gun to cover the entire surface of the styrofoam ball is time consuming - it takes anywhere between 15-45 minutes per ball, so please use your discretion before proceeding with this activity. I wouldn't recommend that any of these ornaments be made without adult supervision - in fact, if you are planning on making this a kid friendly activity, please ensure that you're using non toxic materials, and replace any sharp or hot objects with something a lot more forgiving. And there you have it! 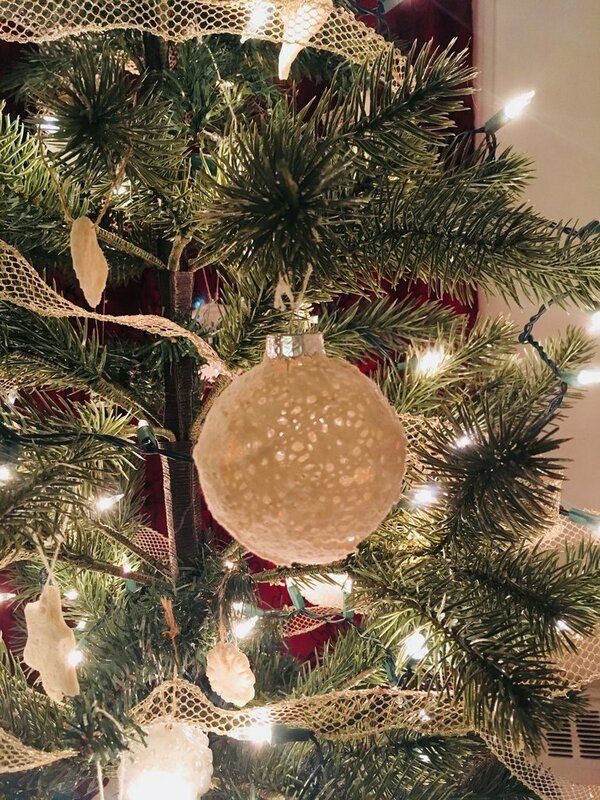 5 different DIY ornament tutorials to spruce up your Christmas tree! You’ll definitely have something to talk about this holiday season! How have you decorated your tree this year? 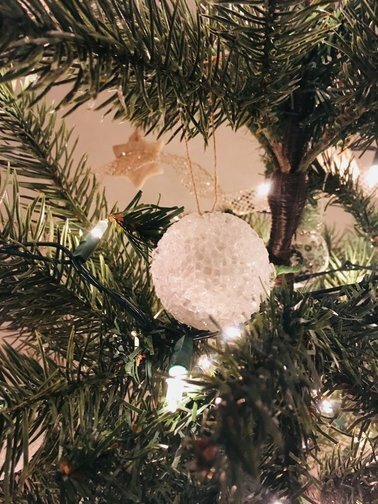 Share photos of ornaments you're proud of on instagram by tagging me @meandering.paths, or post your DIY ornament hacks in the comments below!